FIGURE 25.6.3.- Angular velocity of the Sun as a function of time. It is assumed that the solar system does not lose any angular momentum to infinity (angular momentum is conserved within the solar system). As the Sun contracts, its moment of inertia decreases, so that its angular velocity increases. The contraction during deuterium burning is small and the angular velocity remains constant. The B cloud (forming the Earth, Venus, and Mercury) forms during this period but does not change the solar angular momentum appreciably. (The A cloud may have formed earlier). 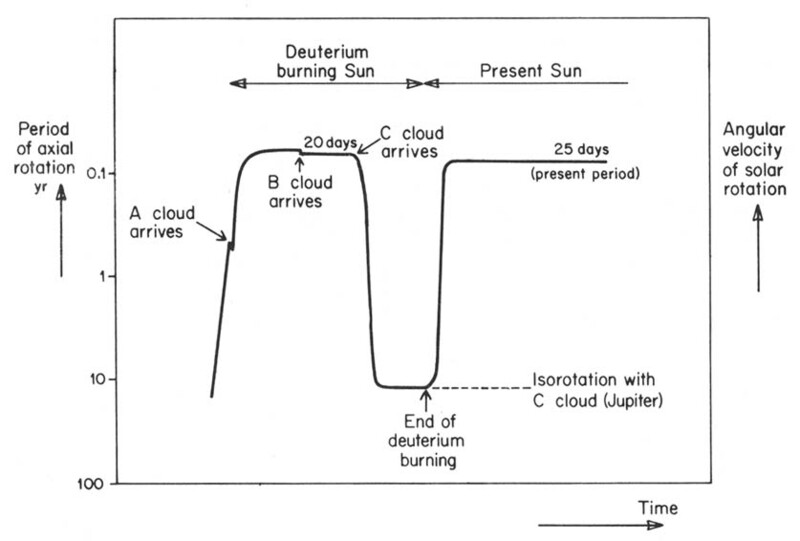 When the C cloud (from which the giant planets accrete) forms, the Sun loses most of its angular momentum and is brought into isorotation with Jupiter (period 12 yr). When the deuterium is totally consumed, the Sun contracts to its present state, with the moment of inertia decreasing by a factor of 200. The angular velocity increases by the same factor, accounting for the present angular velocity of the Sun.